If you're a fan of Jason Aldean then listen up! As the Country superstar will be coming to your local venue this coming spring/summer time! 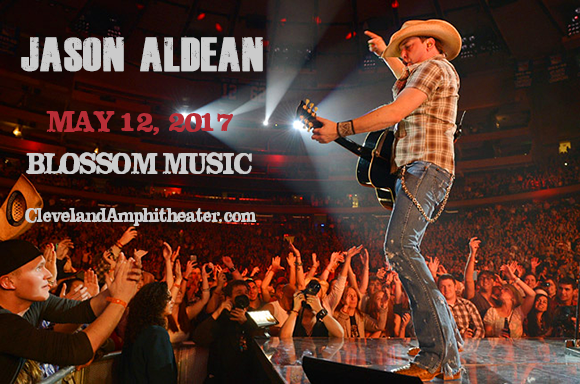 Kick off your summer early with a night that you will never forget, Jason Aldean will be bringing all of his chart-topping anthems to the live stage. Along with support from Chris Young & Kane Brown – this is a line-up of pure entertainment! Catch all of this and more on Friday 12th May 2017 at Blossom Music Center – tickets are on sale right NOW, but not for long, book yours while you can! Jason Aldean hardly needs an introduction as one of the biggest names on the Nashville music scene! With a move to the area in the late 1990's, Jason Aldean quickly began to write and this became a powerful tool for his self expression. From the get go it was clear that the sound he was creating would soon be heard on radios, not only in the United States, but all around the world by roots music fans. His ballad type singer, songwriting is a style that may love and adore, both within the music industry and the people. 2005 saw his first record certified platinum album which would kick start his career and six more studio albums afterwards followed in the same footsteps. Jason's 2012 album Night Train certified as double-platinum and his 2010 album My Kinda Party certified as triple-platinum!